This post is dedicated to Stacey, a fellow blogger on WordPress, who came up with a brilliant idea of promoting other crafting blogs in posts. Stacey very kindly mentioned my blog (with a link) and other crafters blogs that I hadn’t seen before – which was enough to tell me that I too should take up her idea and promote crafters blogs on my own blog here. So, since Stacey came up with the idea, I am firstly promoting her blog (link below) and dedicating this post – and this card – to Stacey. Stacey’s blog can be found here: http://staceyscorner.wordpress.com/2014/06/01/share-sunday/ ~ go and take a look and maybe even click to follow her. To Stacey, a dedicated blog post and card, for an amazing idea! 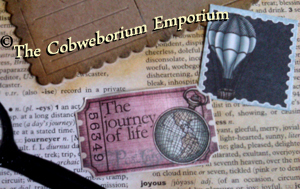 ~ from Cobs.
. . . join me on a journey through this card . 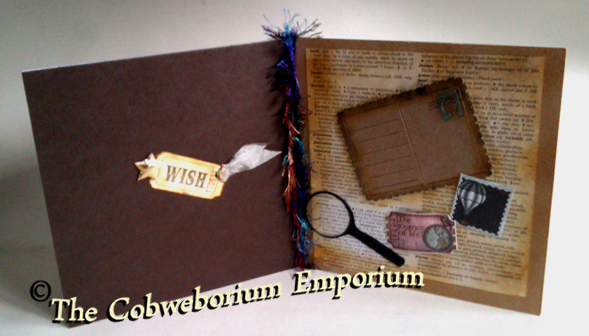 . .
Every few days/weeks … now and again … I’ll make what I call a ‘labour intensive’ card. One of those cards which takes more time than the regular cards you’ve so far seen me post here. This card – ‘Life is a Journey, not a Destination’, is one of those cards. It’s not that these types of cards are difficult, they just take a little more thinking and working out so that you end up with the ‘feel’ that you started out knowing you wanted. 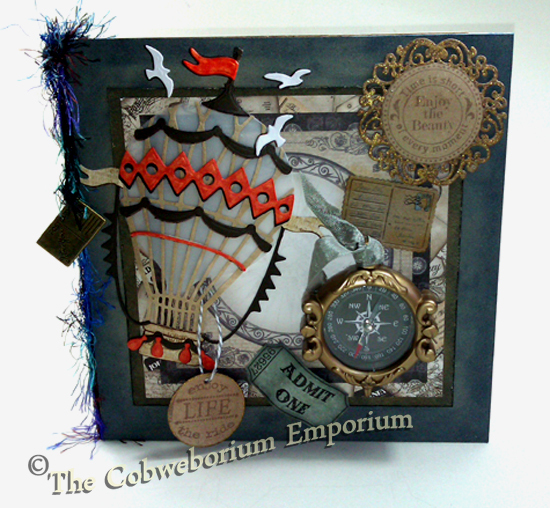 This particular card was inspired by a piece of wall art which I have hung in my bedroom, facing my bed. It’s an iron framed rectangle with a piece of calico strung in the centre and printed on the calico are the words Life is a Journey, not a Destination, and that’s what gave me the theme for the card. I wanted the card to have a vintage style, with a slightly ‘steampunkery’ feel to it – but at the same time I knew I wanted it to carry a message, and wanted the message to be read as either literal or spiritual, depending on who the card ended up with, and the circumstances they were in within their life, at that time. And ... I think I’ve managed it. This card could be for someone who’s:- moving house; going on a cruise or going abroad; it could be a simple regular birthday card (for either a man or a woman); it could be for someone who’s starting a new job; or perhaps for a person who needs some encouragement; maybe some tests soon? ; or … it could be given to someone who is going through some sort of personal challenge or challenging time, and this card would be a gentle, loving way of saying that they’re going to get through this time and move on to a better place or time. I’ll give you a list of everything I used to make this card at the end of the post, because I don’t want anyone to look at the list and think that they couldn’t make a card like this. I might have different stash to you, and I might have different cardstock; dies; ink pads; glues etc etc … but I’m pretty sure you will have things in your stash that you could use to pull a card like this or similar together. Just because the list of stuff I’ve used might look long – please don’t be put off. If you want to make something like this, go and look at your stash. 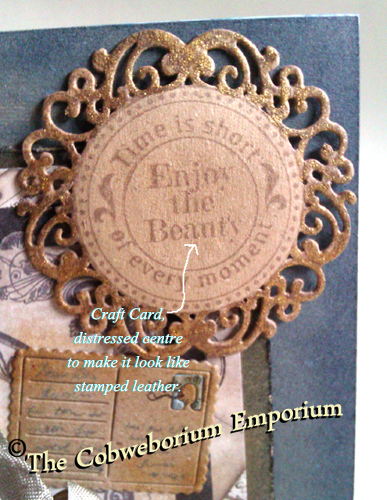 You’d be surprised what you can use in order to make your own style of card. For now .. I’ll just give you different photos of the card so that you can see things closer up…. Up up and away! . . .
A (working) compass to help you keep you going in the right direction . . .
Time passes quickly, – so some gentle encouragement to enjoy the beauty of every moment. 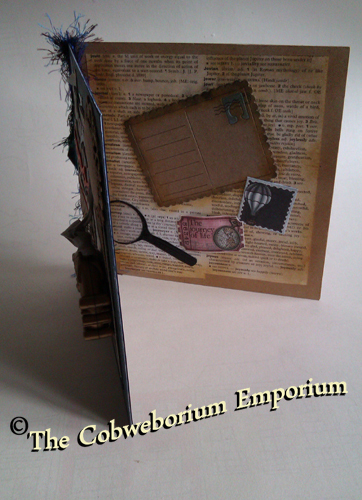 As followers and readers of my blog know … I LOVE to put surprises inside all the cards I make. I feel that the inside of a card is just so wasted and such a let down when you open a birthday/Christmas or any other time card, and find a big white space with a little bit of writing. 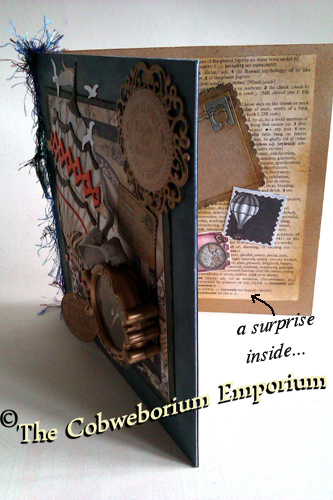 I like cards to be beautiful inside and out and surprise the receiver when they open their card! . . .
OOhh .. another surprise! .. now we have a lucky wish star and a ticket which gives me ‘entitlement’ to one wish! But .. what the devil is that magnifying glass for??? Ah haaaa! . 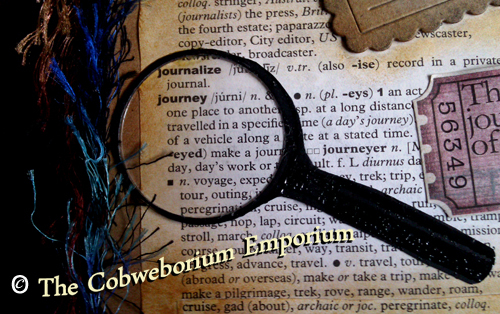 . . It’s so you can read the page from the dictionary/thesaurus! Ok .. one mystery solved, . . . but … what’s that pink ticket by the end of the handle? Oh, and by the way … the postcard inside . . . is for you to write your message on, for the person you’re sending the card to! See? It all makes sense! Sheena Douglass – Little Bit Sketchy – Magnifying glass stamp. 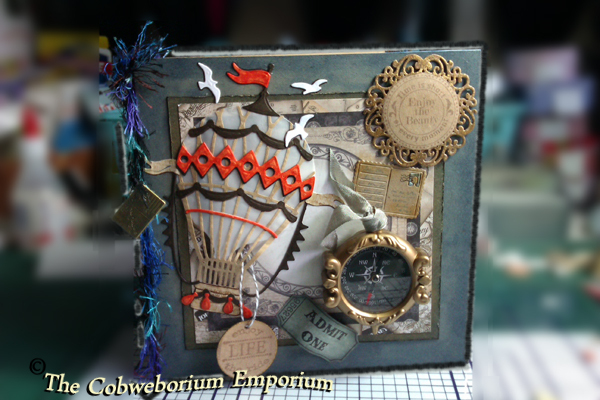 Heartfelt Creations 12×12 pad – which I used some of the images from. 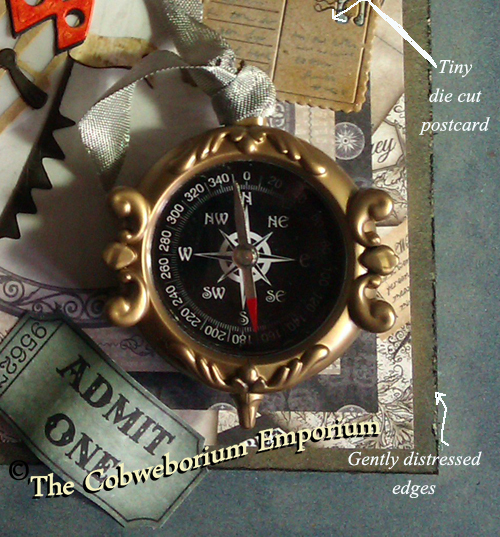 Compass – was in a pack of 4 I bought a while ago, from the children’s section of either Asda or Tesco. Dictionary page was cut from an old Dictionary/Thesaurus which was no longer used. 2 x short lengths of silver-grey Rayon Seam Binding. 3 x fuzzy, funky fibre, Eyelash Knitting Yarn/Wool – 1 x length of warm brown. 1 x length of jet black. 1 x length of a blues and purples mix. 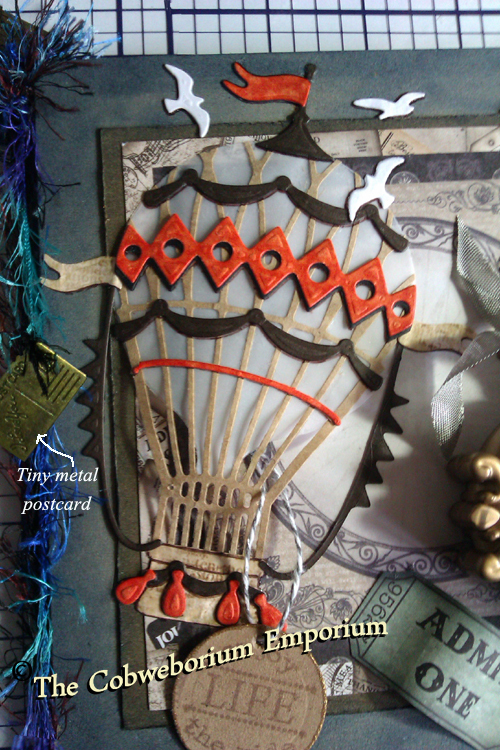 One tiny metal vintage looking Postcard embellishment. Aw, please don’t be daunted by the apparently long list of ingredients for this recipe. I’ve named almost everything I used here just to be helpful to anyone who wants to know where I got a particular thing, or the make of the papers or dies etc, (named everything apart from glue .. but if you need to know: I used Collall All Purpose, Anita’s Tacky Glue, hot glue, and Double Sided Tape) – but I bet you use tons of stuff when you craft a card and you don’t even notice what you’re using anymore. It’s just all … ‘stuff’ … which is treasured and loved, and there because you use it! Thank you so much for coming to read. I hope you like the card! Oh … and don’t forget to visit Stacey’s blog! Please have a look around my blog here and check out the different categories. There’s a list of them all in the column over to the right, – you’ll find the list of categories towards the top of that column. Previous Fairy Shoes ~ Pollens Pods – inspired by a Bumble Bee. Next Ribbons, Ribbons, everywhere, . . . so how about a decent storage solution? First of all thank you for all your kind words and for the link to my blog. Also, that card is so awesome!!! I love, love, love it! You have inspired me to put a little more effort into my cards and see what else I am capable of. I can only wish that one day I can make something as awesome as this. Hello Stacey, great to see you here! Thank you for your kind words regarding the card. If it gives you inspiration then that’s brilliant. But … it really isn’t difficult, so please don’t be put off. I know that it can look daunting when you look at the list of ‘stuff’ that I used, but that’s just a list! Ignore it, and instead just look at what colours you like to work with and use those. Once you’ve got a colour mapped out in your head you’re half way there. The rest is just ‘things’ that relate to each other in some way. 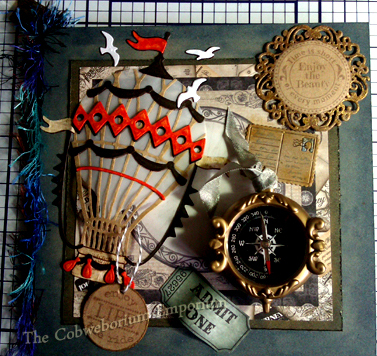 (for example: like the hot air balloon relates to the compass. And the compass also relates to a ‘journey’ – be it spiritual or an actual journey in miles). It’s honestly that easy. You already have the ‘magic’ to make it. Belief is all that’s missing. Believe in yourself. Hope the clickable link to your blog brings a handful of folks to look at your beautiful cards. This isn’t acard…it is a gift. A really nice gift. Thanks. Hello ‘Stampinup’ – thank you for commenting. Honoured to see you here, and again, thank you so much for taking the time to leave such a lovely comment. ~ Cobs.